The looming NBA lockout is an unwelcome news for us, basketball fans all over the world. What would be November (this year) to June (next year) without the great entertainment that is NBA. In fact, the reason why I upgraded our cable channel is to be able to tune in to Basketball TV for its whole season coverage of NBA. My kids wouldn't like this. Oh!, our own PBA couldn't just be a good substitute. 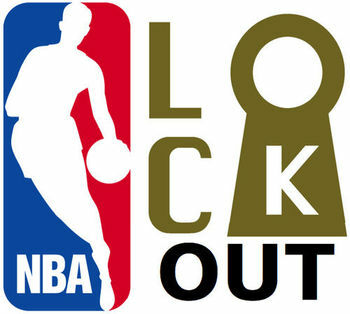 What's this lockout all about. Well, in the NBA, they have a players' union and like any other unions, they do have CBA ( collective bargaining agreement) with the owners group. This CBA has just expired and they are negotiating a new CBA. It's all about money; the owners wanting hard salary caps, reducing the present 57/43 split of basketball income and shorter contracts. Considering NBA's global reach on ads, promos, merchandise, and tv contracts, the amounts are not just in millions but in billions of dollars. BY the way, Derek Fisher, the veteran Laker guard, is the president of the players union. Sometime in the mid 90's, the NBA season was shortened (the normal total number of games in one season is 82) because I think of the same problem. That time, the San Antonio Spurs, led by their twin towers, the veteran David " The Admiral" Robinson and upcoming star Tim Duncan, became the champions. It would start the Spurs titles in the league for the next ten years. Reports are saying Kobe Bryant is mulling a possible stint in China. So imagine Kobe Bryant playing in China, donning perhaps the Shanghai Sharks uniform, now owned by newly retired Yao Ming. Derek Williams of the New Jersey Nets is almost sure of playing with the Turkish team, Besiktas, the same team where Allen Iverson played last year. Where will the other stars go? Kevin Durant, Dwight Howard, Chris Paul, Derrick Rose, etc. Just when we are expecting another exciting season. September is the start of the training camp. We just hope the issue will be settled soon and all's well that's ends well. For love of basketball. Why? Have you heard the news that the inaugural event of the soon to rise ultradome at Mall of Asia will be a regular NBA game? If that happens, that will surely be a real, real, big, big, scoop, perhaps even bigger than the Thrilla in Manila of Muhammad Ali and Joe Frazier in Araneta Coliseum in 1975. Quo Vadis Philippine Dragon Boat Team?